Aeneas was one of the legendary founders of Rome (as well as Romulus and Remus in a different legend), whose story is most famously immortalised in Virgil’s Aeneid. As well as a founder of Rome, Aeneas was believed a son of Venus-Aphrodite, a survivor of the Trojan war, the lover of the African Queen Dido, and the progenitor of the Julian house. 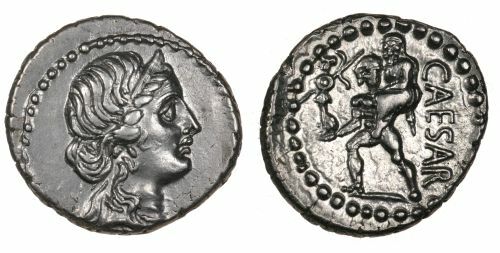 On this silver denarius of Julius Caesar, Aeneas is shown carrying his father, Anchises, on his shoulders, and the Palladium in front of him. The Romans claimed to have the Palladium (a bust of the goddess Minerva-Athene) of Troy through Aeneas’ rescue of it, following the fall of the city to the Achaeans. On the obverse is the goddess Venus, the mother of Aeneas and thereby also a mythical progenitor of the Julian house from which Caesar came. The use of this imagery at the dying days of the Roman Republic was probably intended to promote Julius Caesar, and his house, as true Romans, worthy of honour and senatorial rank.